Thrivent Financial and VocalEssence invite you to help us throw a baby shower for the moms and babies participating in The Lullaby Project. Nothing conveys the intimate bond between mother and child quite like a lullaby. The word itself summons images of quiet moments and tender whispers of love. Every baby deserves a lullaby. 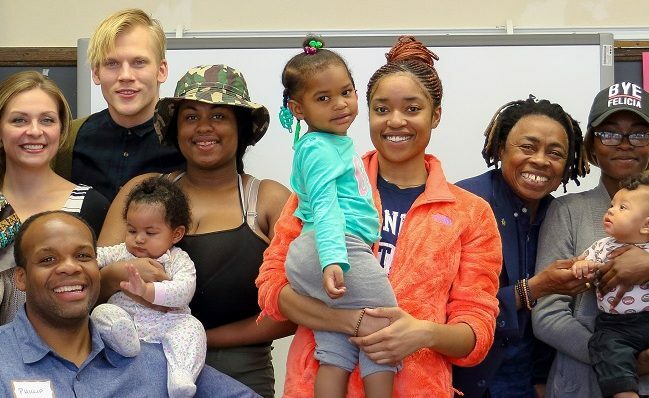 VocalEssence and the Longfellow High School for Pregnant and Parenting Teens are partnering to bring The Lullaby Project to Minneapolis teen mothers. This program pairs teen moms with local composers to write lullabies that embody their hopes and dreams for their babies. Visit our Amazon Wish List and purchase much-needed items for Lullaby Project families. Feel to share the wish list link with anyone interested in giving. Items will be shipped directly to VocalEssence, and gift bags will be assembled at the January 14th Together We Sing Festival. If you are planning on attending this event, you can bring a gift directly to the table and help us pack a bag. However, you do not have to attend this event to donate items through the Amazon Wish List. Thank you to Thrivent Financial for taking the lead with this wonderful project for a great cause!